These options will continue to increase over time so check back regularly to see what’s been added. A slight deviation from technology for a brief moment if I may. 2015 marks the 100th anniversary of Australian and New Zealand soldiers (ANZAC) landing at Gallipoli on the Turkish peninsula. What many people don’t appreciate is that after the evacuation 9 months later, these plus more troops, fought with great distinction on the Western Front from 1916 – 1918. 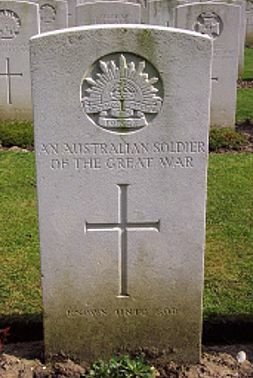 Just in time for ANZAC day 2015 (April 25th) I have completed an eBook with information from the site but also including the GPS location details of over 600 cemeteries in the region where Australians are buried. The eBook also contains the GPS locations of Victoria Cross actions. For anyone interested, have a look and let me know and please feel free to refer the site and the eBook onto other who may also be interested in the sacrifices these men made and the legend they created. Many users are familiar with traditional drive letters when it comes to saving Office documents. In some cases they struggle to understand the transition to UNC paths, navigating to web based locations or opening from a browser. 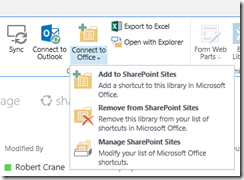 To help them with this transition they can pin common SharePoint Online document locations to their favourite Office applications access menus. 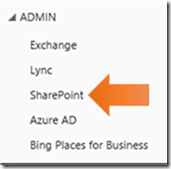 Now, the traditional way to add a SharePoint location to an Office application was to locate to that location in SharePoint (i.e. a Document Library) and then select the Library tab in the top left. That revealed the Ribbon Menu. On this Ribbon Menu, towards the right, you would find the button Connect to Office. Selecting this would then map that location into your Office documents to make it easy to open those files directly. Alas, from what I can determine this option doesn’t current work with SharePoint Online in Office 365. So here’s an alternative. 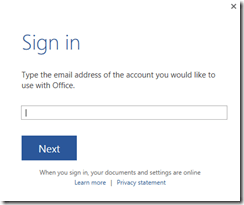 If I open Word on the desktop as shown above you can see that I am not currently logged into my Office 365 account. I do this by selecting the Sign in to get the most of Office in the top right. I’ll now be prompted to enter my Office login details. I may also be prompted to enter my password if the system doesn’t recognise me. Once I have logged in successfully, my identity will appear in the top right as shown. 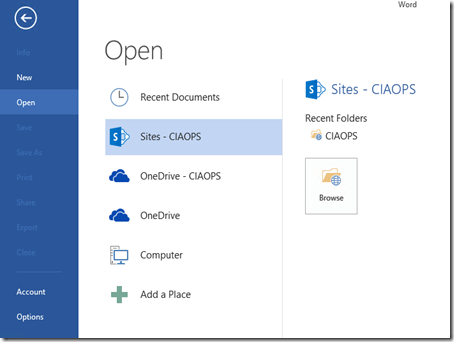 Now when I go to open a document you see that I have already have my standard SharePoint Online Team site (Sites – CIAOPS here) and my personal OneDrive for Business (OneDrive – CIAOPS here). If I select my Team Site, on the right you’ll see a folder with your Team Site (in this case the folder CIAOPS). If you select this folder, Windows Explorer will open and so you your normal SharePoint Team site (i.e. 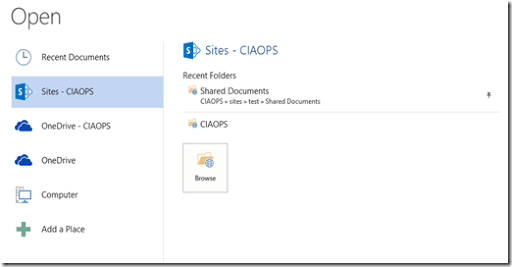 http://tenant-name.sharepoint.com, here http://ciaops365e1.sharepoint.com). So you can now navigate to the file that you need to open. However, what happens if you need to regularly open a file from a completely different site collection you have created? That is, with a different URL from your normal Team Site? Easy. Just select the Browse button and when Windows Explorer comes up change the URL in the path to be the one you want. 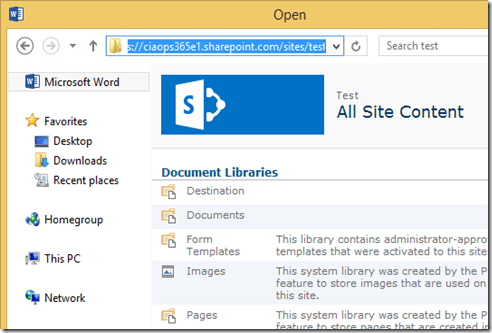 In my case I have changed the URL to a completely separate Site Collection located at http://ciaops365e1.sharepoint.com/sites/test. Navigate to the location you want to save and open a single file from there. If you now navigate back to the Open location option in the Office application you should see the new location listed as above. To save this location so it can be reused to open files simply hover over the entry and you should see a push-pin at the right. Press this to ‘pin’ it there. With the item pinned, every time you restart the Office application it will be there to allow you select files from there, even though, in this case, it is in a different Site Collection from the standard Team Site. Wow! Eighty episodes in the can and only 20 more till I reach 100! No bad going at all, even if I do say so myself. Tas joins me once again to cover off the latest Office 365 news as well as take a deep dive into SharePoint Team Sites. We look at what Team Sites are, the best way to use them and how you can get started using the resources they provide. There is a lot of confusion between OneDrive for Business and Team Sites when it comes to Office 365. 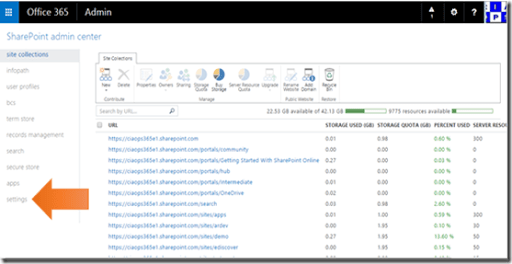 We have completed a deep dive into OneDrive for Business a few episodes ago, now it is time to go deep into the other option you have available with SharePoint Online. Listen up for more than just an explanation, learn how Tas and I suggest you implement Team Sites for customers. Don’t forget to give the show a rating as well as send me any feedback or suggestions you may have for the show. I’m also on the hunt for some co-presenters so if you are interested on being a regular part of the show please contact me. Here’s a nice video from Microsoft that explains how Office 365 works and how it goes about streaming video down through Azure Media Services. Just wanted to let you know about a special guest for tomorrow’s (Thursday, 19th March 2015 at 12.30pm Sydney time) free Cloud Business Blueprint Ask Us Webinar. I have managed to secure David Coote, Director of Sales and Marketing for Rackcorp to present on the hosting, servers, networking services and so on his business provides. You’ll get an overview of what Rackcorp offers including a live demonstration of their platform and features. If you attend on the day you’ll be able to ask questions directly of David and his team. Also, David will graciously be offering a special deal to all Cloud Business Blueprint members. We’ll be recording the session for Cloud Business Blueprint members to view on demand so if you can’t attend but are interested in the content I’d urge you to sign up as a Cloud Business Blueprint member to receive this and all the other benefits our community has. Remember, membership is simply month by month and you can cancel at any point, no questions asked. and feel free to pass on that registration link to anyone else whom you feel would benefit from attending. to get your questions ready. I hope to see you on the day and if you have any question please don’t hesitate to contact me directly. Interestingly, when it came to filenames there were certain characters, that if in a filename, would prevent that filename from syncing. Generally, these characters were the same for SharePoint Online and SharePoint on premises. However, as someone pointed out to me this is no longer the case. 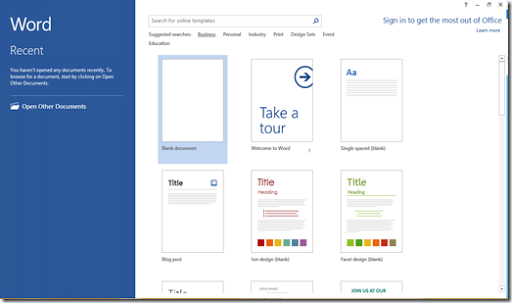 The above article details how the ‘&’ character is no longer invalid for SharePoint Online but remains so for SharePoint Server 2013. When you read the article you’ll also see that there are beginning to be quite a few differences in what is permitted between SharePoint Online and SharePoint Server 2013. This is clearly an indication that SharePoint Online is being updated much faster than SharePoint Server 2013. So now you’ll have to check the above article a little more closely to see exactly what is an isn’t permitted for different versions of SharePoint. The reason that it no longer appears is because many of the Gallery options require scripting and this comes with security issues. So, Microsoft has elected to disable this by default. 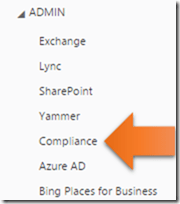 Login to the Office 365 portal as an administrator and select the Admin icon from the App launcher. 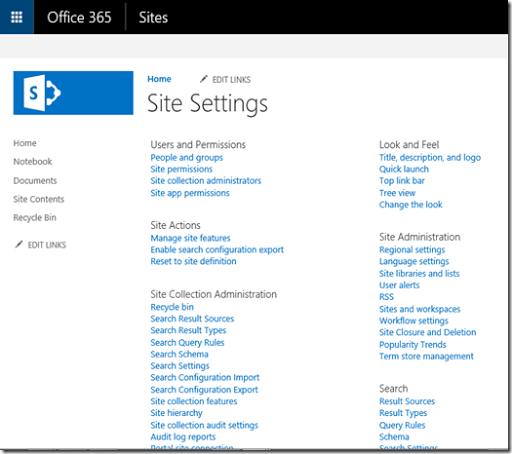 In the bottom left of the Admin portal, select SharePoint under Admin. This will take you to the Sharepoint admin center as shown above. Select Settings at the bottom of the list on the left. Select the option to Allow and save the changes. 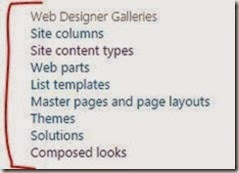 It may take up to 24 hours for these changes to flow through to SharePoint Online and until you can see the Web Designer Galleries options in Site Settings.